Here is your Gemini Horoscope for August 2018. Every month, you will find at WeMystic the astrological forecasts for your zodiac sign. Pluto, Mars and Saturn will be in retrograde in the VIII House of Gemini during the first half of August, placing tension in relationships. Although Vesta will have initiated its direct phase in the VII House of the twins on the first, constituting a favorable atmosphere that supports committing more to your companion, the planets in the VIII House will demand more attention. These alignments suggest that it is a period for speaking clearly and healing old emotional wounds. It will be a crossroads between building better understanding or letting yourself get carried away by hidden grudges. The entrance of Venus into the V House of Gemini (08/06) represents opportunities for romance for single people, as well as moments of family fun, motivated by short journeys or walks. In the same way, the entry of the Sun into the IV House (08/23) where Ceres will be located, can be interpreted as a reconnection with the women in your family (both older and younger), renovating your home or possibly moving. It is a good time of the year to clean out your closets and storage lockers as well as spend time with your family. The eclipse of the Sun in Leo will affect the III House of Gemini on August 11th, reminding you of the importance of connection with the people around you in addition to continuous learning, both formal (academic) and experiential. 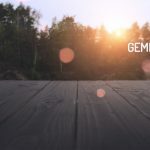 On the other hand, the Full Moon of August 26th will touch the X House of Gemini, which means that you will establish a new concept of personal success and get rid of any previous responsibilities that did not correspond to you. Finances will remain stable for the sons and daughters of Gemini in August. However, the entry of Mars into the VIII House of the sign (08/12) during its phase of apparent retrograde is an invitation to review any businesses and properties that you maintain along with relatives or your partner. It is worth remembering that Saturn and Pluto in retrograde will also be located in the VIII House of Gemini, which implies that verifying agreements and new procedures related to updating them will be a slow but necessary process. On the other hand, Venus will enter the V House of Gemini on August 6th, amplifying your creative capacity and desire to share your natural talents with those around you. However, with Chiron retrograding in the XII House of the twins, it is likely that you will receive little support from coworkers and friends. If this happens, do not take it personally and try to not get discouraged. Many people inside your social circle will be going through difficult times and their attention will be far from your area of influence. Open up to listening to them and offering emotional support to whoever needs it. With Venus in the V House and Jupiter in the VI House, the followers of Gemini will have everything going for them to be able to stand out for their inventiveness and efficiency in the workplace, something that will probably lead them to take on new responsibilities. It is important to note that Neptune will be in retrograde in the X House of Gemini and Lilith will enter the IX House of the sign (08/06), a position that it will share with the South Node of Karma (things that must be overcome). With these alignments in mind, if you are trying to expand a professional project internationally, it is a good idea to review its details, given that you may be too optimistic and disregard its practical side (legal or tax matters, for example). Additionally, you could get into conflicts with officials or people who try to advise you on a particular subject, because you think that you know the whole truth about it or want everything to be done your way. This is due to Lilith in the IX House. By paying attention to the advice and experience of others (free by the way), you will be able to minimize future pain and learn from it, as well as establish contacts that will prove to be valuable in the future. For the students of Gemini, the presence of Lilith in the IX House of the sign can lead to personal conflicts associated with your area of study (Is this your true vocation or would you go for other interests?). Avoid unleashing your frustrations on others and take advantage of the opportunity that Lilith gives you to understand what deeply motivates you and to discover new interests. August will be a positive period for the health of the natives of Gemini. Jupiter and the asteroid Psyche will be in the VI House of the sign, which favors physical and psychological therapy sessions as a part of recovery. Mercury, ruling planet of Gemini, will continue in retrograde in the III House of the twins until August 18th. Regarding this, it is a good idea to watch out for respiratory diseases (flu, allergies) or symptoms of chronic coronary diseases. With the entry of the Sun into the IV House of Gemini (08/23), the site where the dwarf planet Ceres will also be located, there is a chance that you could move or deep clean your surroundings (organizing spaces, classifying belongings, donations) . If you decide (or you should) participate in this type of activity, do not forget to protect your mouth and nose with the appropriate equipment (surgical mask or related items). One aspect that you should consider at this time of the year is the beginning of the retrograde of Uranus in the XII House of Gemini starting on August 7th. This will test your idea of independence. Uranus in retrograde in the XII House of Gemini could lead you to become isolated from your social circle, sacrifice your well-being for the support of others or fall into depressive crises, due to comparisons with the past.